"A traditional Irish potato dish, perfect with a roast or chicken!" Place potatoes in a large pot, and add enough water to cover. Bring to a boil, and cook for about 10 minutes, until potatoes are soft enough to mash. Drain. Transfer to a large serving bowl, and mash potatoes with 1/4 cup of butter and all of the sour cream until well blended. Melt remaining butter in a large pot (you can use the same pot) over medium heat. Add garlic and green onion, and cook, stirring until softened. Add the cabbage, cover the pan, and let the cabbage steam for about 10 minutes, stirring occasionally. Stir the cabbage mixture into the mashed potatoes, and season liberally with salt and pepper. Serve hot. I love potatoes and cabbage but this did nothing for me. Mixing two of my favorite sides... mashed potato and steamed cabbage... how could I go wrong? This was great, easy and affordable. I didn't change a single thing about this one. No need to! I made this for Thanksgiving as an alternative to traditional mashed potatoes. It was a huge hit! Thanks! 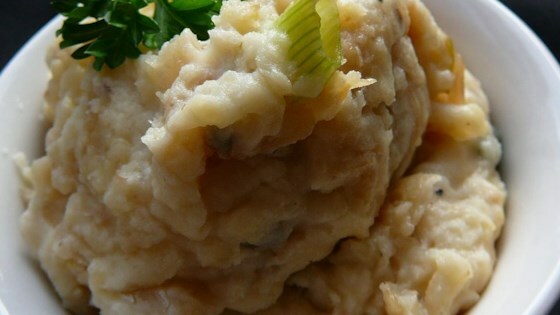 I usually use kale when I make colcannon...this is a very good recipe. Thanks for sharing it! Excellent !! My husband doesn't like cabbage and could not even tell, he loved this dish. Thank you for a healthy mashed potatoes !! Will do regularly.